The hyena is one of my older son's favorite animals. He loves carnivores and he is fascinated by Africa. So his toy hyena ranks highly in his pack of animals! His love of hyenas and African Hunting dogs took us to a zoo in another town where we could visit Spotted and Striped Hyenas. Unfortunately the Hyenas didn't come out much while we were there. 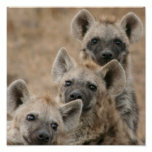 But we've been learning all about them and will share lots of information about hyenas on this page. Hopefully we'll get to go back and visit the Hyenas soon. Hyenas are not dogs. They do share a lot of features with dogs, but in evolutionary terms they are actually closer to cats. 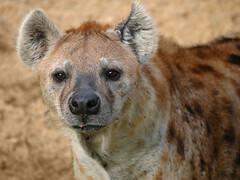 The Spotted Hyena is the best known and most common species of Hyena. 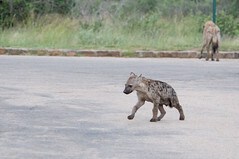 Spotted Hyenas live in Africa including South Africa. The Hyena features prominently in African mythology and not always in a good way. The Hyena is children's TV show Tinga Tinga tales is often naughty! 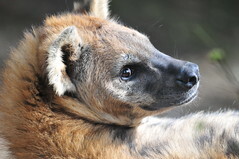 Hyenas have a reputation as scavengers, feeding off the remains of other animals kills. While this does happen, Hyenas do kill their own prey. 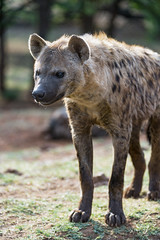 Spotted hyenas are particularly good hunters. The Spotted Hyena is also known as the Laughing Hyena. The sound that humans identify as sounding like laughter or giggling is nothing to do with Hyenas finding things funny. It's actually an agressive sound. Hyenas laughing is a sign of aggression. It's often heard in when a pack of hyenas is trying to get a good position at a carcass. 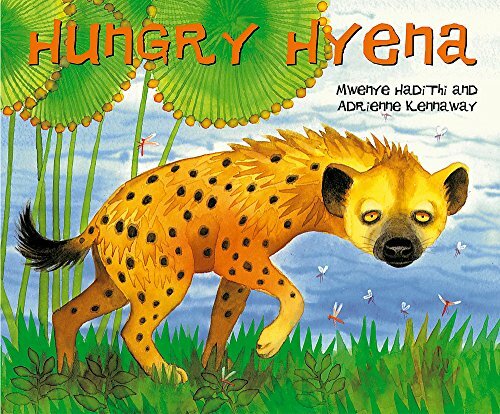 Our favorite Hyena story book in the Hungry Hyena by Mwenye Hadithi and Adrienne Kennaway. The African Tales Book Series is brilliant. 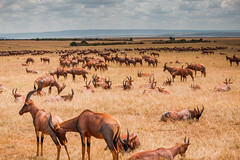 The books really evoke the feeling of Africa and its mythology and climate. In Hungry Hyena, hyena steals Fish Eagle's catch. He learns his lesson though and that is why he now slinks about the African plains, unable to run like the wind. This take on a traditional African folk story is a wonderful way for kids to learn more about African animals like the Hyena and the culture of the land they come from. The striped hyena is less well-known than his spotted relative. 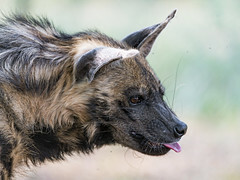 The striped Hyena is native to North and East Africa. 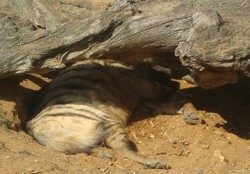 We managed to take a photo of a striped hyena sleeping in the sun. Hopefully we'll see a bit more next time we visit. 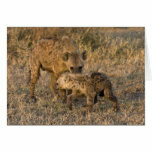 Do you know someone who loves Hyenas? 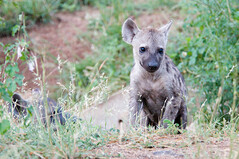 Before we finish, let's look at some pictures of gorgeous Hyenas in their native Africa. I did! I didn't know their "laughter" was actually a sound of aggression. Interesting.